- Stick it to suitable surface in your bathroom. - Spread peanut butter or cream cheese on your dog licking pad. 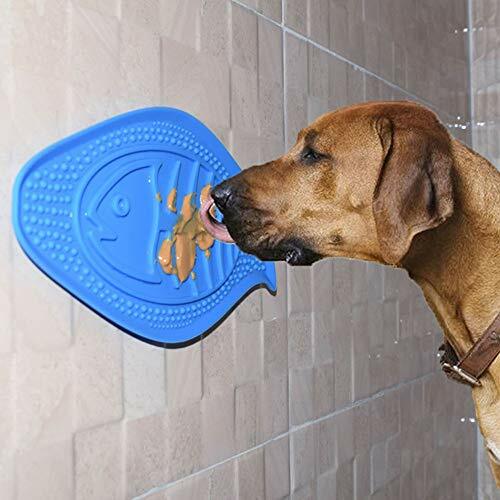 - You can easily wash your dog while your dog is licking the pad. - You can easily wash your pad with your hand or a dishwasher. 【Unique Shape, Safety Use】The fish shape dog bath toy designed with serrated surface on front side, it prevents food or butter from spreading. Back side with 6 suction cups, make it stick firmly on tile, smooth wall and glass,etc. 【Easy Use】Just stick dog licking mat to your tub or shower wall, then spread peanut butter or cream cheese on it. After using, just rinsed or wiped the tray for next use, dishwasher free. 【No Risk Purchase】All MalsiPree product provide 30 days money back and 12 months replacement guarantee, priority contact us directly for any issue or complain, 100% satisfaction solution will be provided. If you have any questions about this product by MalsiPree, contact us by completing and submitting the form below. If you are looking for a specif part number, please include it with your message.